There’s some kind of idea of Italy here, or rather the idea of the idea of Italy, as opposed to the idea itself. 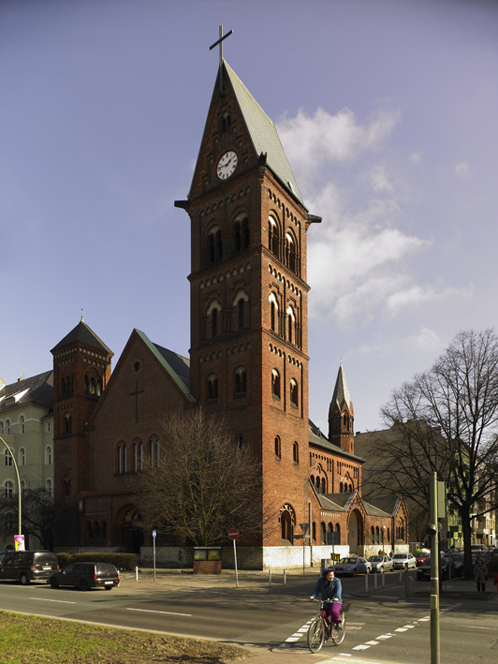 Eclecticism, pastiche, ersatz culture, whatever; designing a protestant church in Berlin a hundred or so years ago was when an architect got to let it all hang out, design a few towers. Each one could be more whimsical than the one that came before, as long as they were all made out of those red bricks. Campanile, campanilo, campanilotto -as the Wikipedia entry on Italian diminutives states, “there are no limits to suffixation, which could continue”. Thanks again to Victor Brigola for his photographic offerings to this humble channel of architectural conjecture.